Exclusive! The glories of the garden in crisp, cool cotton. 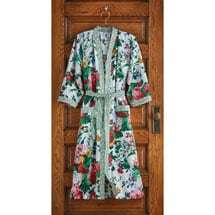 Classic kimono-style robe has a shawl collar, long sleeves, front pockets, and tie belt. Hangs 49". 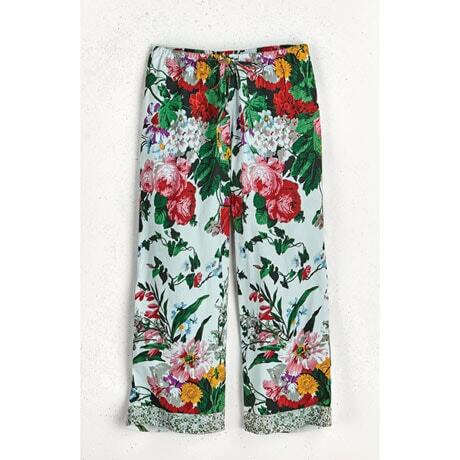 Matching pajama pants have an elastic drawstring waist and 21" inseam. Pair with your own white tee or colorful cami. Robe in sizes Sizes S/M(4-12), L/XL(12-18),pants in sizes S(4-6), M(8-10), L(12-14), XL(14-16), 1X(18-20), 2X(20-22). Machine wash. Imported. Sold separately.